Job Seeking in Japanese Lang. & Lit. The 2010 ATJ Annual Conference Professional Development Special Interest Group (SIG) Session, which was held in Philadelphia this past March, was titled “Hiring and Job Seeking: Two Sides of the Academic Job Search in Japanese Language and Literature.” It was designed to complement a similar panel, “The ‘i ro ha’ of finding a Japanese-Language Job,” which was held at the 2007 ATJ Annual Conference in Boston. The 2007 panel focused on three areas for Japanese-language job applicants. Kazumi Hatasa of Purdue University covered “First Impressions: Cover letter and curriculum vitae,” Yasuhiko Tohsaku of the University of California at San Diego spoke about “Developing an Effective Teaching Portfolio” and Rebecca Copeland, along with Ginger Marcus and Shino Hayashi of Washington University in St. Louis presented “The Job Interview for a Language-Teaching Job: Dos and Don’ts.” A mock interview at the end of the session allowed the audience to observe some of the common mistakes made in interview situations and introduced strategies in presenting one’s strengths. The aim of the 2010 panel was to reach out to applicants, in particular recent Ph.D.s in Japanese literature, who find themselves competing for jobs that require both language and literature teaching. Panelists were selected to represent a wide range of institutions of higher education. Jan Bardsley from the University of North Carolina at Chapel Hill, Jeremy Robinson from Grand Valley State University, Ann Sherif from Oberlin College, and panel organizer Janet Ikeda, ATJ President, from Washington and Lee University shared their experiences in a roundtable discussion format with the audience. The panelists focused on the portfolio, the search committee perspective and the campus interview and ended with a Q&A session. We were pleased that this important topic attracted a large and diverse audience. Although the focus was on the language and literature job search, many of the points raised by the panelists could be applied to the language job search as well. I feel this type of session is always important to the ATJ membership and contributes to the professional development of a continuous stream of job seekers. There are institutions that prepare their graduate students for the job market with guidance about putting together a dossier and preparing for a campus visit, but there is undoubtedly a noticeable need for more professional workshops on this topic. I will give a summary of each of the presentations and include comments from all the panelists. It is important to remember that some of this “advice” can be a matter of opinion, depending on the experiences of each panelist or the nature of their home institution. The audience was warned that a difference of opinion is not uncommon when taking into consideration the uniqueness of institutions and their hiring practices. Preparing a job application begins with a close reading of the job notice and the university and departmental webpage. The applicant needs to fully understand the nature of the institution in terms of size, type and focus, and present a unique packet for each job. There may be a tendency to save time and send out the exact same set of materials to each institution, but writing a cover letter that specifically addresses what the applicant can bring to the needs of that particular department is more effective. It is crucial to understand that there are different kinds of departments, ranging from small East Asian Studies or East Asian Language and Literature units to larger Modern Language Departments that encompass all the languages offered on campus. 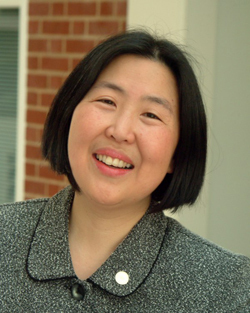 Search committees can sometimes include colleagues from other departments or from other language and literature disciplines. Remember that one is part of a larger community of professionals. Being a member of professional associations, such as the ATJ, tells the search committee something about you. Some institutions may require a recorded example of your teaching, along with the cover letter, letters of recommendation, syllabi, and teaching philosophy statement. Make sure that the format is one that is easily accessible to the search committee, so that they do not need to search for special equipment to view the recording. The clarity, sound and angles of the recording should be fully considered. One panelist recommended taking the highlights of your teaching, as it is rare that a search committee will watch the entire hour-long recording. You will be requesting letters of recommendation from graduate school faculty members and former or current colleagues. It is your responsibility to send gentle reminders and make sure those letters are submitted on time. An incomplete job application file can easily put you on a secondary list of viable applicants. Each institution wants to think that you are a serious candidate for their job opening. Simple mistakes such as forgetting to cut and paste the correct institution’s name in your cover letter can be disastrous. It is worthwhile to invest as much time learning about the institution as you hope they will invest time in learning about you. You want to know where the program and or university is going and how you can be a part of their future. The second part of the discussion moved to understanding a search committee’s perspective. When one is on the job market, it is often difficult to visualize what is happening on the hiring side. First of all, envision yourself as a colleague and engage your interviewers in discussing how you can best contribute to the department. There are three basic kinds of interviews that can take place. A telephone conference call interview or interview at a conference can often be a way for a committee to make their short list before inviting you to campus. Telephone interviews are surely the most uncomfortable. You need to reduce background noises (neighbors, colleagues or children) and make sure you convey enthusiasm with your voice. If invited to a campus interview, be aware that your search committee may want you to meet with a wide range of constituencies on campus. You could have an itinerary where you will meet not only with members of the search committee, but with members of HR, the International Studies program on campus, the director of a media center or language lab, language and literature students and instructors/teaching assistants. You need to make sure you customize your best questions for each individual or group. Asking good questions means that you have already done some preliminary homework. It is discouraging from the search committee’s perspective to have a job applicant’s first question be about the size of the student body. This kind of general institutional information is easily found on their homepage. A more pertinent type of question might be about recent news about the department or program that has appeared on the university homepage or information found on the departmental webpage. If textbook information is not available on the homepage, be sure to ask and mention what textbooks and teaching methods you have used. If you have made it to the campus visit stage of the job application process, then you represent a big financial investment on the part of the institution. Take care of yourself and be sure to get a lot of rest. Often times a candidate may stay up late preparing the night before a trip to a campus interview. Getting up at the crack of dawn to catch a flight, possibly being delayed and forced to miss a meal, arriving only to confront sudden changes in your appointment schedule; all these kinds of situations can and really do happen. The panel talked about seeing candidates who arrived exhausted from the time they stepped off the plane. While you anticipate heading to the hotel to sleep, you may be scheduled to have dinner that evening with members of the department. While a search committee tries to schedule with consideration for the applicant, they are challenged by having a limited amount of time in which to coordinate the schedules of multiple parties. If the dean is going out of town for the next two days, you may need to meet with her the afternoon you arrive. Taking care not only to be prepared, but rested and in good health sounds like obvious advice, but is well worth being repeated. Slipping an energy bar or extra bottle of water in with your job talk notes is not a bad idea. It may also be productive to take a leisurely walk around campus, if you find yourself with free time in the evening or morning. As you walk around campus, be sure to pick up the student newspaper and catch up on the current hot topics or read notices on bulletin boards. And, most importantly, think of every encounter as part of the official interview. Whether you are chatting in the car from the airport to campus, walking to the next venue with a student, having breakfast with a search committee member, or waiting for your appointment in the presence of an administrative assistant, be sure to be friendly and professional to everyone you meet. One department head at my institution says she always asks the administrative assistant what kind of impression the applicant gave when out of sight of the search committee members. Every single moment is part of the larger interview. The job applicant should also realize that while on a campus interview, the search committee is responsible for “selling” the institution. They want to show their best side and advantages, which may include a strong department, generous university funding, clear information about tenure and promotion, a mentoring program, faculty workshops and opportunities for development, and even the benefits of living in a big city with all the conveniences or a scenic rural town. The job talk and teaching demonstration are two very big moments during the campus interview. The research talk is critical and needs to be presented clearly and concisely. More than one colleague has mentioned attending a job talk where the applicant went into too much detail or rambled on with great expertise about something that held little interest for the audience. Be sure to ask about your target audience and whether you should aim your talk for the level of the specialist or the informed listener. Teaching demonstrations for a language and literature position may possibly mean teaching in both settings and utilizing very different methods and techniques. A simple reminder to speak up while addressing the class, especially when the search committee may be sitting way in the back, is also obvious but sometimes easily forgotten under stress. The department wants you to ask good questions that reflect your deep interest in taking this position. You should ask not only about benefits, tenure and promotion guidelines and teaching load, but about the nature and achievements of the students. While teaching the demonstration classes, be sure to show a genuine interest in the students and praise them for their accomplishments. The students are probably just was nervous as the applicant. They are unaccustomed to your teaching style and some may feel that they, and not the applicant, are the ones being scrutinized by departmental faculty members. The end result one hopes for is a job offer. As our panelists shared, the negotiations for a job may be just as stressful as the campus visit. It is easy to feel so grateful about being offered the job that one forgets to ask about important details. Before accepting the position, you can ask about salary, medical and dental benefits, moving expenses, on-campus housing for new faculty, spousal opportunities, campus childcare, mortage assistance, tuition benefits for family members, research funds, pre-tenure leave and funding opportunities, a shorter tenure track, a reduced teaching load in the pre-tenure period, office equipment such as computer, printer and or scanner, office furniture and perhaps more important at some institutions than others, a parking permit! It is sometimes a shock to find out when you arrive at a large institution that you may be on a waiting list for months or even years in order to get a parking permit near your building. In closing the session and before taking questions, I shared with the audience a list of “10 common mistakes” that I collected from experienced colleagues at my home institution and elsewhere. These should be taken as opinions and not as blanket statements. Each interviewer has his or her own bias and each institution has a certain personality that they wish to match with an “ideal” candidate. The cover letter is a genre in itself so you should study and know that genre. Never put extra personal information such as a photograph or the number of your children in the cover letter or on a CV. Ask for a letter of recommendation from a faculty member who really knows you. Getting a boilerplate letter from someone who is particularly famous may not serve you well, especially if that famous, busy person writes the exact same letter for two candidates applying for the same job. Be sincere when you apply for a job. The committee is extra cautious about an applicant who appears to be applying in order to negotiate a raise at their current institution, or who applies insincerely to a small, liberal arts college in a rural area when they really want to be at a big research institution in a city. If there are gaps in your CV, be sure to explain why you have had three visiting positions in the past few years. Do not leave circumstances up to people’s imaginations as they may assume the worst. If you have taken visiting or adjunct positions elsewhere, demonstrate how you have taken advantage of teaching or grant-writing workshops during your “rōnin” period. During the job talk or teaching demonstration, watch out about giving a handout or power point presentation that has too much information. Know the institution where you are applying. One department head looks for a convincing paragraph in the cover letter that shows enthusiasm for the kind of teaching and research expected at that particular institution. Look up information about the people in the department and note their specialties and course offerings. A job applicant wants to fill in the perceived gaps in the curriculum. It may be seen as a threat if the applicant wants to offer the same courses that are already being offered by another department member. Keep your answers short and be aware of your listener. Unfortunately, there are search committees who have members at odds with each other or who have one member known for asking inappropriate questions. Have a strategy in mind and practice in advance so that one is not thrown by an unexpected remark or question. This was our second year working in conjunction with the Consulate General of Japan in Los Angeles as well as the Japan National Tourist Organization to host the All Japan Booth at Anime Expo (AX). North America’s largest gathering of Anime and Manga fanatics lasted from Thursday, July 1st 2010 to Sunday, July 4th, 2010. New from the Japan Foundation, Los Angeles was the display of our matoi, which is an object use by ancient Japanese firemen to notify people of a nearby fire. These are no longer used in present day Japan and only serve as a ceremonial item. In addition to our matoi, we also brought both our O-Yoroi costumes for display purposes and also to let attendees try on. A raffle was held three times a day to provide attendees with the opportunity to wear and model the infantry O-Yoroi costume in front of our booth. We also provided attendees with short lessons on how to write their names in Katakana. This activity was started last year and has become very popular with all the guests, especially children, who dropped by our booth. All three organizations provided brochures and other give away items that supported the overall mission of our booth which is to share the Japanese language and culture of Japan with Americans as well as promote tourism to Japan. At the end of the four day show, we had given out all the literature in our booth making this one of our most successful events during the year. All over the world, Anime and Manga is synonymous with Japan and this event certainly shows that the popularity of Japanese pop culture is still very strong with the youth in the United States. 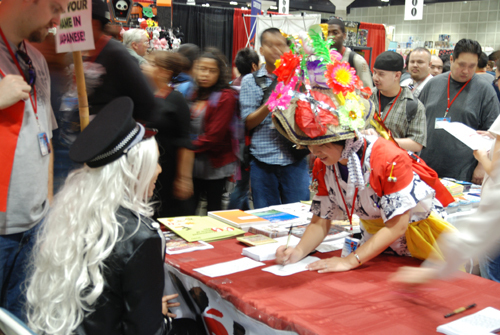 The majority of the attendees at AX were in their teens so we hope that their interest in Anime and Manga will eventually lead to an interest in studying Japanese language and culture in school. Events like this allow America’s youth the opportunity to connect with the culture of Japan so they can better understand the country, its people, their history, and hopefully be able to travel there someday. Being able to fulfill one of our foundation’s missions of promoting language and culture exchange has definitely made this opportunity invaluable to our cause and we hope to be back again next year. In July of 2010, the Japan Foundation, Los Angeles, invited three members of The Furoshiki Study Group to present a lecture and workshop on the Japanese square cloth known as Furoshiki. The three instructors Ms. Akiko Sakai, Ms. Naomi Ando, and Ms. Keiko Fukuda were invited from Japan, to present their newfound uses of the Furoshiki to promote environmentalism and to reduce waste by reducing our use of plastic bags. This lecture and workshop was conducted in three cities on the west coast including Los Angeles, Denver, and Portland. We received much interest for this event and the seats quickly filled up with more than 210 RSVPs for this rare opportunity to learn about this oft forgotten item in the history of Japanese culture. The lecture focused on the history of the Furoshiki detailing its origins as a bath mat to that of a gift wrapper to present day uses such as a tote bag. This was followed by explanations of the many different colors and designs that were dyed into the cloth, each with special meaning and symbolism. Finally, the hands on portion of the workshop allowed participants to practice working with a Furoshiki. They learned to tie the two fundamental knots that are essential to using a Furoshiki and also wrapping various objects such as a bottle, book, and ball. Afterwards, the participants were able to look at the specialty Furoshikis that were brought from Japan and used during the lecture. By bringing back the Furoshiki and conceiving new uses for the square cloth, the Furoshiki Study Group’s goal is to use this recyclable tool to combat the environmental crisis facing the world today. Their belief is that if everyone started using Furoshiki to carry around groceries instead of plastic bags, we would be more environmentally friendly as a whole and be able to reduce our use of harmful plastics. This event was very successful for us and was in line with our mission of promoting Japanese language and culture with the United States. We look forward to presenting our next event and hope to see you all there. 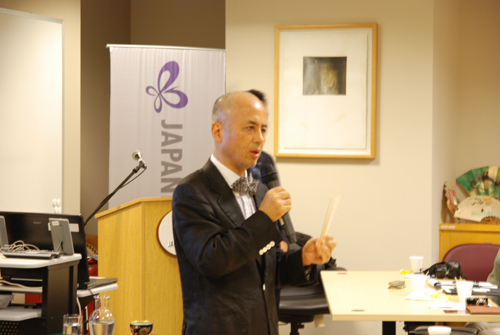 On Wednesday, August 4th, 2010, The Japan Foundation, Los Angeles, hosted the first event in the Fireside Colloquium series for the 2010 fiscal year. This series was started last year in cooperation with Shigeharu Higashi of Cultural News. The purpose of Cultural News is to connect enthusiasts and promoters of traditional Japanese culture in Southern California. Mr. Higashi publishers a monthly newsletter and also periodic email blasts to announce opportunities to experience Japanese culture. Fireside Colloquium was the brainchild of Mr. Higashi to allow professionals in the field education to learn about unique areas of traditional Japanese culture from specialists in various fields. The format of this event included a lecture followed by Q&A time ending with networking time allowing attendees to mingle with each other and talk to the guest speaker. For this event, JFLA invited 5th Generation Art Fan Maker, Mr. Kanji Ishizumi, to talk about the history and cultural significance of the Japanese fan. The Ishizumi family has been making fans since 1881 and before that, they were renowned Tea Masters with his ancestor Sekishu Katagiri being the Japanese Tea Coach for Shogun Ietsuna Tokugawa during the 17th Century. 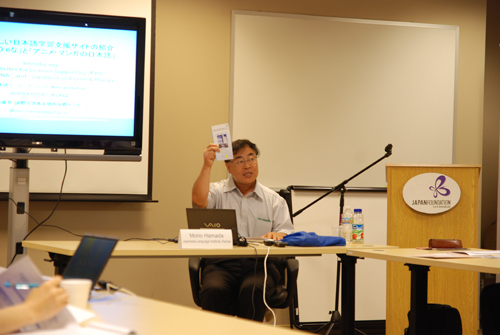 Mr. Ishizumi compared the Japanese folding fan with the Iphone in that it was a communication tool during the ancient times. The way women held their fans indicated their interest and writings and artwork on a fan communicated messages between two people just like a cell phone. He also talked significantly about the history of the folding fan as well as the process that he goes through to make a fan including all the individual parts. Many examples were provided of modern uses for the traditional Japanese fan and Mr. Ishizumi along with his wife even brought displayed many fans from their personal collection. There were over 30 people who reserved a seat for this event with everyone who attended enjoying the lecture on Japanese Art Fans. “Very interesting and informative information provided about traditional crafts.” “I was amazed at the complexity of the process.” Attendees ranged from students, to teachers, to professionals in photography, film, and art. This was a very successful program for JFLA as the event served a dual purpose of introducing a facet of Japanese traditional cultural and also to open up our Nihongo library to attendees. We hope to organize another event as part of the Fireside Colloquium series in our office in the near future and hope to continue this event for many years to come. 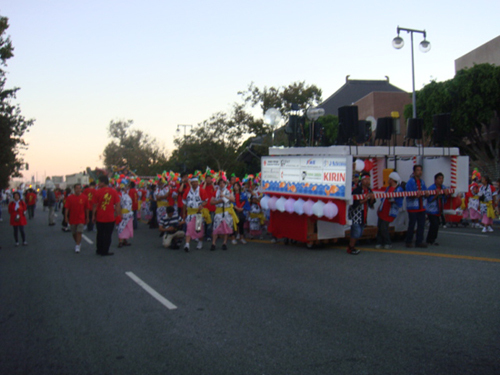 This year, members of the Japan Foundation, Los Angeles, volunteered several weekends over a month before the parade to help prepare the floats for the event. Although all the decorations for the float were saved from the event last year, the actual rolling platforms for the main Nebuta float, taiko float, advertising float, and sound float had to be rebuilt from scratch. In order to have the floats ready in time, work on the floats started in early July and lasted up to the day of the parade. Work took place in the Mikawaya parking lot on weekends with anywhere from 15-20 people, including members of the Japan Foundation, who volunteered their time to create and decorate the floats. There was also much support from the community as everyone was eager to see the Nebuta floats again this year at the Nisei Week Parade that was held on August, 15th. As the weekend of the parade drew nearer, work ramped up to move the empty floats to the Union Church of Los Angeles parking lot, which was the starting point for the parade. Moving the floats required police escorts as the floats were too big to be moved on the city sidewalks and needed access to local streets to move them 3 and a half city blocks. About 20 volunteers showed up late at night on Friday, August 13th – two days before the parade, to help with the move, which was completed with any problems. The next day, the sound engineering team showed up to mount all the necessary electronics to make sure the music can be heard by everyone on the parade route. This year, additional speakers were added to increase the acoustics on both the sound float and advertising float and it had a big affect compared to last year. On the day of the parade several hundred volunteers showed up to help with the Nisei Week activities and also to help with the climatic Nebuta Parade. Each float required several people to operate and there were over a hundred Haneto Dancers that accompanied the float during the parade. Specialists from Aomori were also present to help out with the setup making sure everything was just like how they did it at home. The Nisei Week parade started at 5:30PM and the Nebuta floats were the last to go at 7:00PM. It took about 2 hours to push the floats around the parade route, which was roughly 8 blocks around Little Tokyo. Afterwards, all the audio equipment was removed from the floats and there was a small celebration at the Miyako Hotel conference room to mark another successful Nebuta Parade. The next day, all the floats were torn down and the decorations were moved for display. This marks the third year that we were involved in the Nebuta Parade and if it wasn’t for the sponsors and volunteers for this event, it would not have been possible. On Tuesday, August 17th, 2010, Mr. Morio Hamada from the Japan Foundation’s Japanese-Language Institute, Kansai, presented a mini workshop detailing their work. Recently, the Kansai Center has released several website, for leaners of Japanese, including Nihongo e な、and the Anime Manga no Nihongo website. 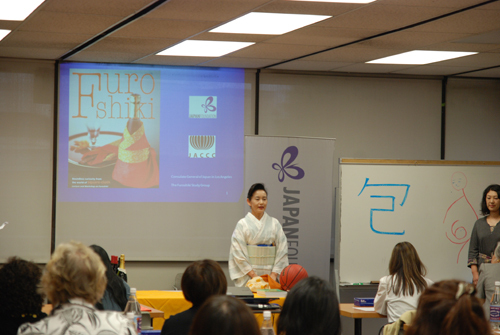 Participants were from all levels of education including primary, secondary, and post secondary levels of education as well as Japanese language schools in Southern California. Most of the participants have never been to the Japan Foundation, Los Angeles, and this opportunity gave them a chance to learn about one of our missions, which is to provide learners of various backgrounds with the necessary materials to acquire the language. The first part of the workshop covered the activities of the Kansai Center and the research that went into creating the Nihongo e な website. Nihongo e な is a search engine like site that retrieves websites related to learning Japanese based on the criteria the user inputs. It was developed based on surveys taken by the Japanese Language Institute, Kansai, to find out what kind of sites learners use to study Japanese and also how they choose the sites. Some of these criteria included how often the site was updated, the reliability of the information, if it cost anything to use the site, the amount of advertising, and the content. What the Nihongo e な wanted to do was review these sites for the learners and present them with a portal with the most useful Japanese learning websites available. After the presentation, participants of the workshop were given time to try out the website to get their impressions on the usability of the site. The second part of the workshop covered print and online materials developed by the Japanese Language Institute, Kansai, and focused more on the Anime and Mange website. This was created due in part to the popularity of Anime and Manga around the world and appeals to those who enjoy this aspect of Japanese pop culture. Original characters were created for this website to teach learners the different ways that Japanese is spoken in Japan by different groups of people. For example a child will use a different set of words and politeness compared to a servant or someone who speaks Kansai dialect. This website also features character expressions, original manga scenes, word quizzes, and Kanji games. After the presentation, participants were able to play around with the websites and provide constructive feedback to Mr. Hamada on their experiences and how the materials can be improved. Overall, this event was very successful with everyone who attended commenting that the information provided was very useful and they were grateful for the opportunity. We hope to have more opportunities like this in the future and look forward to seeing you all there.